[On-screen text] Dealing with financial stress. Financial challenges have a wide-reaching impact on your life. When money or debt problems become an issue, they tend to take over. You can’t focus at work, you may have arguments at home and it can even start to affect your health. But letting fear take over isn’t going to help you move forward. So, you need to take the steps to minimize the impact of financial stress. The first step is the bite the bullet and take stock of where you are. This is often the scariest part, because you have to face reality and your financial fears. Once you know where you are, you can take the right steps to get where you need to be. As you evaluate your situation and start looking for solutions, experiencing some level of stress is natural. But if you have physical or mental symptoms of extreme stress, see you doctor. These include high blood pressure, panic attacks, insomnia and depression. Keeping a regular schedule, maintaining a healthy diet, and exercising all help you minimize the physical and mental effects of financial stress. Be honest with your entire family about what’s going on. You don’t have to scare your kids, but letting them know that money is tight will help them understand why your stress level is high. And take time to relax, enjoy yourself and have fun with your family. Focusing on the right things can help put stress into perspective. Find someone to talk to – your spouse, a family member, a close friend, a member of the clergy or a professional who you can confide in to get things off your chest. And do what you can to keep financial stress away from your job. Trying to handle creditors or collectors at work is a distraction and you need to focus on keeping your job. Remember, you can tell collectors not to contact you at work and tell them when it’s inconvenient for you to talk at home. With that in mind, put time into your schedule to focus on your finances and start looking for solutions. If you are struggling with debt, we have solutions that can help you. Simply fill out our form or better yet, call us now and we’ll match you with the best solution for your situation. We are A-plus rated by the Better Business Bureau and have helped thousands of people become financially stable. So, don’t struggle any longer. Give us a call. When life happens, we’re here for you. 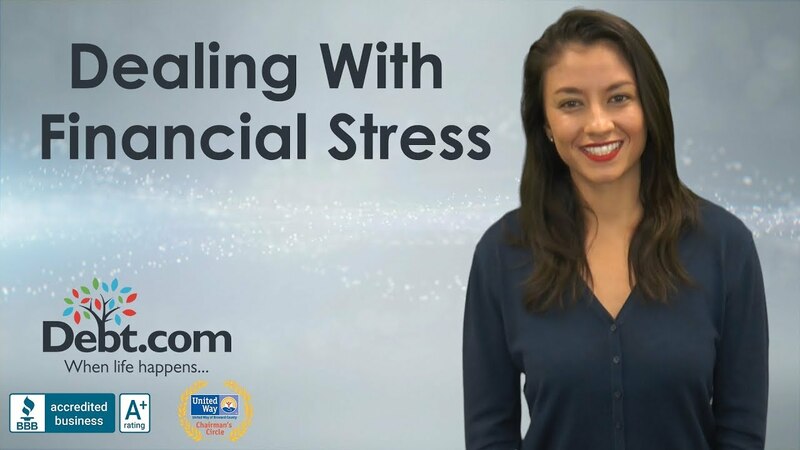 Learn how to deal with financial stress in a healthy way, so it doesn’t affect your life. Money is the second most common cause of stress in the country, according to a 2017 poll by the American Psychological Association. With 62 percent of the nation affected by financial stress, it is only outnumbered by stress over the future of our nation (63 percent). You’re not alone when it comes to stress over money and debt. The APA’s recent survey on stress found that one-quarter of Americans are stressed about their ability to pay for essentials. If you’ve ever been in debt, you probably know what financial stress feels like. Stress is the release of hormones like cortisol and adrenaline into the bloodstream to help you cope in physically or emotionally demanding situations, or when you feel threatened. In small bursts, it is helpful, such as when you are on a time crunch for a project because it allows you to focus on what you need to do. That concentration, burst of energy and added strength can also be helpful if you face a crisis. Your heart will race and your muscles will often tense up during times of stress. Stress is a means to help your body in short bursts. However, with finances and especially with debt, stress isn’t just a short burst. It is a constant feeling of dread and worry, which impacts the wellness of your mind and body. Constant stress can negatively affect your physical and mental health. Pain in the shoulders, neck and back, as well as headaches, can all be effects of stress. Many people also experience digestive and stomach issues during prolonged periods of stress. Think about in the movies when how people working stressful jobs are seen eating Tums or other antacids and are diagnosed with stomach ulcers. Sleep is also negatively affected by too much stress. That feeling of not being able to turn your brain off at night because of so much worry can lead to a lack of sleep, which can not only affect your body, it can also harm your brain. When you are stressed and your body doesn’t feel well, it can cause twice as much of an impact on your mind. Continued stress causes the inability to concentrate on tasks, greater irritability, inability to control emotions like anger and sadness, increased anxiety and restlessness. These feelings can lead to negative behaviors like smoking, drinking, overeating and can also lead to depression. Dependency on alcohol, drugs, etc. All these symptoms can lead to problems at home and work. Finances are a major factor for stress and divorce within a marriage. A study from the University of Wisconsin found that while money isn’t one of the top subjects of common arguments, it is one of the most complicated for couples to discuss and solve. It’s important to be open with your loved ones when financial problems arise. This includes your children, who can become confused when they can’t do things they might be used to doing or can’t go places with their friends. They might not understand what it means to be in debt, so simply explain to them some things are too expensive right now, and offer some fun, free options of things to do instead. Make sure to also keep your financial stressors out of your workplace. Make sure debt collectors aren’t contacting you at your work or during work hours. According to the Fair Debt Collection Practices Act, a collector must honor any request if you say you do not wish to be contacted when you are at work. This can help you concentrate on work and not on avoiding calls. There are multiple ways to help cope with stress and manage your financial stress. The first step is to take stock of where you are with regards to your finances and general wellness. Gather up your bills and debts and try to create a budget, cutting out nonessentials or even bills that can be postponed or lessened. Next, think carefully about your physical and mental health. How are you feeling? Think about where the issues in your body are. What are you eating? Try to be conscious about how much you eat and what you eat. A poor diet can contribute to additional health issues. Are you exercising? Take a walk or run to clear your head. Even just spending some time outside can be good for your health. If you don’t feel like yourself or even think there is the possibility you may be depressed, seek professional help immediately. It is important that you take the right steps to lessen your stress levels, otherwise you’ll never be able to take steps to get your finances under control. Improving your mental and physical wellbeing is the most important step to achieving your financial wellness goals. Once you are in the right space, you can start to think about solutions. If managing your finances on your own seems too daunting, try enlisting the help of a professional. 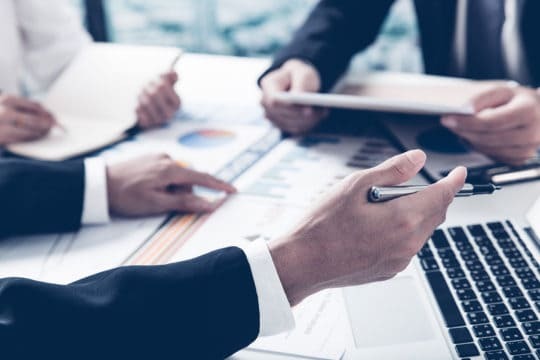 Certified Financial Planners and other debt management specialists can help you create a budget to pay off your debts and find a way to build up your savings. 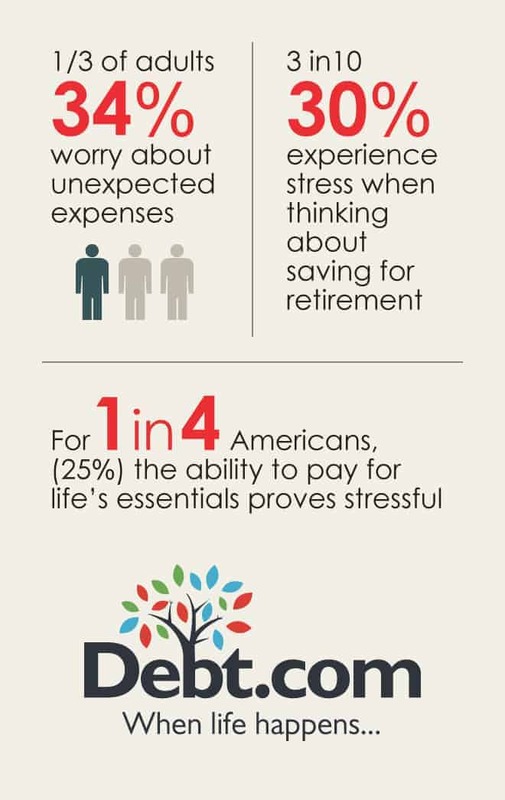 Once you are managing your financial stress, it will be much easier to handle the other stressors that come your way. Are you financially stressed? Debt.com offers solutions to help you overcome your stressful debt. Article last modified on April 24, 2019. Published by Debt.com, LLC . Mobile users may also access the AMP Version: Coping with Financial Stress - AMP.